Home / Gopala Gopala / Movie News / Pawan Kalyan / Venkatesh / Gopala Gopala Audio Launch Postponed ? Gopala Gopala Audio Launch Postponed ? If highly reliable sources are to be believed, the audio launch of Pawan Kalyan's Gopala Gopala has been postponed once again. Contrary to reports that the audio would be unveiled on January 1, latest buzz indicates that the audio release would take place on January 3 (Saturday). Since the makers are stuck with the shooting of the song that would be wrapped up on Wednesday, producers Suresh Babu and Sharrath Marrar are planning to release audio on 3rd. As reported earlier, Ramanaidu Cine Village in Nanakramguda would be the venue for the grand event. In fact, Venkatesh-Mahesh Babu starrer Seethamma Vakitlo Sirimalle Chettu audio launch was also held at the same place. 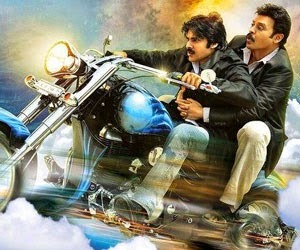 Since Gopala Gopala has Pawan and Venky in the leads, same tradition would be followed. However, there is no clarity on the release date of the film. The movie would be either be released on Jan 9 and if it fails to come on Jan 9, it'd come on Jan 14. Buzz is that Suresh Babu is planning to advance the film's release to have an edge over Shankar's I. Suresh is of the opinion that since Pawan and Venky are so popular and no need of additional publicity, he has plans up his sleeve to advance the movie to Jan 9. But the big hurdle for Jan 9 release would be the Censor Board clearance.